Vetting vendors for your wedding day can be an exhausting and confusing process. While each has their own set of lofty promises and rave reviews, how do you know which will best understand and execute your vision? One of the benefits of working with Paper & Diamond is that we have put in the hours to build a network of trusted partners across all realms of your special day. 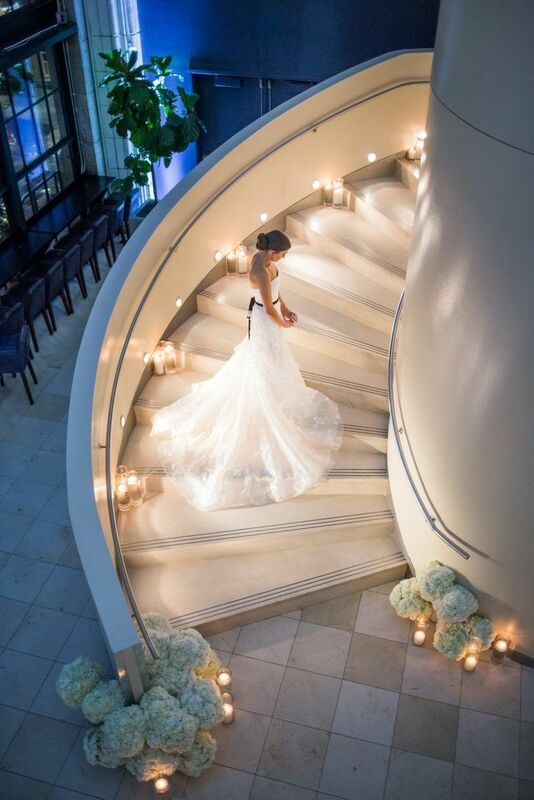 For over a decade now, Bride & Blossom, led by Rachel Trimarco, have been serving the greater New York City area with a wedding floral boutique that delivers lush and exquisite results. We have yet to find a more trusted resource for uniquely customized wedding day florals to proudly collaborate with. Recently our friends at Bride & Blossom reached out to us to get our take on the ultimate luxury honeymoon destinations. However, just as each and every bride’s taste and style varies, each couple finds a different interpretation of what the ideal way to embark upon a lifetime of wedded bliss involves. Thus, we have partnered together to define a few different bridal styles, and what honeymoon travels these styles are often drawn to, in order to help inspire the dream honeymoon you may not have even realized would be perfect for you and yours. After all, with peak engagement season upon us as the holidays approach, you just might find your daydreaming turning to a wonderful reality sooner than you anticipate. Your style is simple, timeless, and elegant. When you sit down with your wedding photos years from now, that Carolina Herrera dress is going to look just as stunning as when you wore it down the aisle. Your special day was celebrated with floral décor in shades of white and ivory complemented by pale touches of pink with silver accents. Nouveau Jardin at Le Bristol Paris. The grand entryway of the Le Bristol Paris hotel. The magical gardens of Le Bristol Paris. 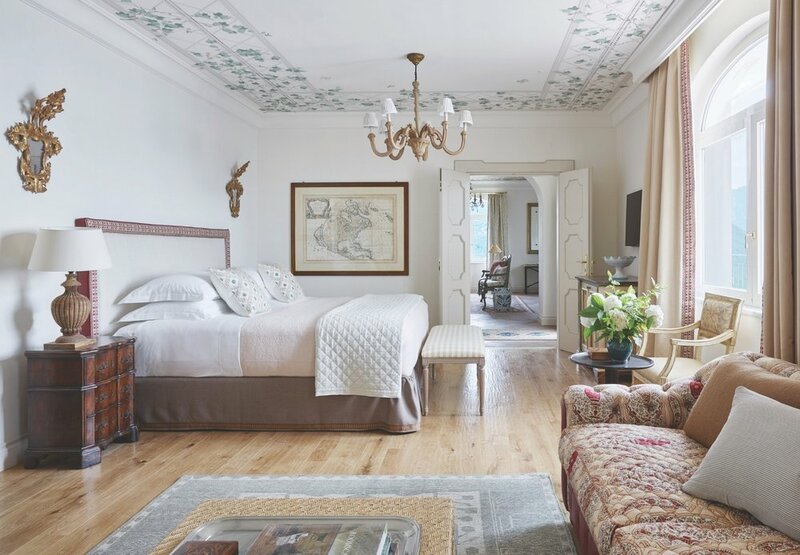 Undeniably, Paris suits the classical tastes, what with its wide boulevards lined in historical buildings where colorful flowers spill out the window boxes, or the world-class museums and petit boulangeries. The romance of this city seems to cast a spell on all who find themselves here – you’ll notice couples strolling hand-in-hand seem to be everywhere you go. Paris offers a complete destination in and of itself to explore the true meaning of romance, yet it also provides a great jumping off point to the Cote d’Azur, Provence or Normandy. Champagne lounge at Hotel du Cap–Eden-Roc, French Riviera. A suite at Hotel du Cap–Eden-Roc, French Riviera. Swimming at sunset at Hotel du Cap–Eden-Roc, French Riviera. An aerial look at the front of Hotel du Cap–Eden-Roc, French Riviera. Monastero Santa Rosa Hotel & Spa along the Amalfi Coast. Belmond Hotel Caruso on the Amalfi Coast. Perhaps a side effect of the Italian renaissance, there is something about stepping off the plane in Italy that instantly infuses a higher sense of enlightenment and call to experience the flourishing culture, both past and present, the country has to offer. Seek out the spectacular ancient architecture in Rome before experiencing the simple sophistication of the Amalfi Coast. A personal favorite is Lake Como, one of those rare destinations where you are able to feel you have truly escaped from the real world. Inside the Belmond Hotel Caruso on the Amalfi Coast. 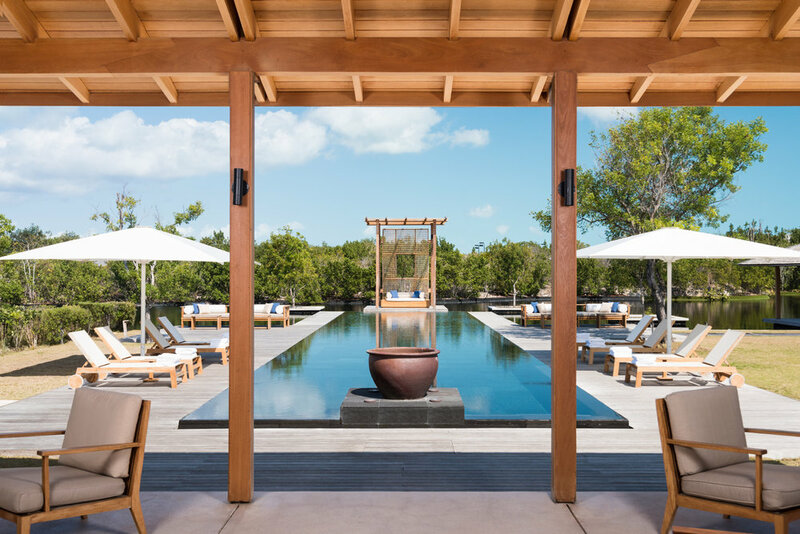 For a tropical island getaway, we recommend Turks and Caicos, one of the more discreet locales in the Caribbean portfolio. Preeminent beaches with turquoise waters stretch endlessly out into the horizon, offering ample opportunity for both relaxation and adventure. Fine dining spans a wide variety of cuisines, and an emphasis on wellness and spa treatments make this option a sensorial wholistic paradise. Your style is best described as sleek, minimal, and unfussy. Your sophisticatedly chic Romona Keveza dress with silver belt made a bridal statement that had everyone talking long after the wedding. Stylish and clean, wedding flowers were mostly white with a surprising pop of color here and there. When Greece comes to mind, one might picture the cerulean domed white-washed facades of Santorini. Yet the experienced explorer will clue you in that Greece offers a myriad of other experiences across the country and surrounding islands. From sampling wines made from grapes grown in the ancient volcanic soils of Milos, to island hopping in the Aegean Sea, your Grecian honeymoon spans a comprehensive blend from charming history to premium luxury. While Bali seems to be a trendy travel option these days, you may be surprised to know that what awaits is an unassuming and low-key getaway. This Indonesian province is surrounded by coral reefs, highlighting the most biodiverse marine life you can find anywhere in the world, with both black and white sand beaches. With tourism comprising the island’s main industry, the dedication to travel experience on behalf of the locals, as emphasized in the wellness industry in particular, is well-worth traversing oceans for. A once in a lifetime occurrence such as a honeymoon should sacrifice nothing, hence the appeal of the Niyama Private islands as part of the Maldives. With two separate islands dubbed “Play” and “Chill,” you need not surrender one or the other when you can truly incorporate the best of both worlds. Endless outdoor adventures await, everything from yoga to jet-skiing, not to mention an underwater restaurant, tropical outdoor bathtubs and showers, and every lush amenity imaginable. Your style is free, relaxed, and eclectic. Everyone couldn’t get over how effortlessly beautiful you looked in your stunning floral lace gown by Liz Martinez. When it came to wedding florals, you wanted to evoke a natural and romantic mood with lots of volume and texture. Pattern, texture, taste – what is not to love about the stimulating experience Morocco has to offer? To begin married life bonding outside of your comfort zone in a culturally rich country such as Morocco can be such an exciting way to bring you and your beloved together like never before. The country is approximately the size of California, so it should come as no surprise that mountain getaways, desert escapes and seaside fishing villages can all combine to create a diverse geographic experience. There is something special and indescribable about the spirit of Tulum, like a oneness with everything around you; an ideal energy to tap into as you start your life as husband and wife. Wellness and healing are at the forefront of the culture, with respect always afforded foremost to nature and organic craft. Should this not all be enough of a selling point, the jungles and infamous cenotes are insanely picaresque in their lushness, providing the all the adventurous romance a honeymoon should contain. When considering honeymoon travel, it almost seems that Africa should surface as a plausible frontrunner more than it does. In sheer statistical speaking, the continent accounts for 20% of the earth to be explored, although, the rationale reaches much further. Unparalleled service comes to mind, particularly for honeymooning couples as all the stops will be pulled out to showcase every imaginable detail. A safari experience in the African bush puts you up close and personal in nature like you’ve never before experienced, and surrounding island holidays or coastal road trips can satiate the desire for beachside holiday. A big thanks to Bride & Blossom for allowing us to explore some of our favorite corners of the world alongside them. Which of these destinations seems to pique your curiosity? Do you relate strongest to a particular one of these three styles? We would absolutely love to hear more. You can get in touch with Paper & Diamond here.